Lately, I can't help but be drawn to bright colors which has had me thinking of one of my favorite summertime treats. I actually tried my hand at making homemade popsicles over the weekend and the results were much tastier than any version I made with Kool-Aid growing up. I think it's safe to say you can expect a few popsicle recipes popping up around here before summer is over with. In the meantime, here are a few things that made me smile and reminded me of this classic summer treat. 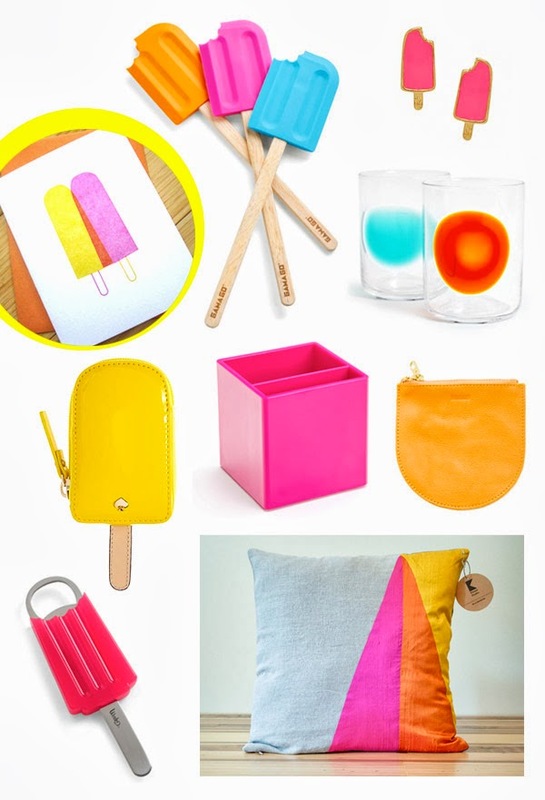 Shop These Items: Studio SloMo Popsicle Card via Etsy // ModCloth Popsicle Spatula // Kate Spade Popsicle Studs // Jonathan Adler Clear Dot Glasses // Kate Spade Popsicle Coin Purse // Poppin Pink Pen Cup // Baggu Leather Pouch // ModCloth Popsicle Bottle Opener // Kisson Studio Pillow Cover via Etsy.